People use iPhone and iPad to browse the Internet as they offers a fast and smooth web browsing experience. But things like ads and popups could be disturbing when we are browsing the Internet on our iDevice using Safari. If you want a more comfortable web browsing experience, try using an ad blocker app. But before you start to look for the best iOS ad blocker, you can first enable the pop-up blocker in Safari. 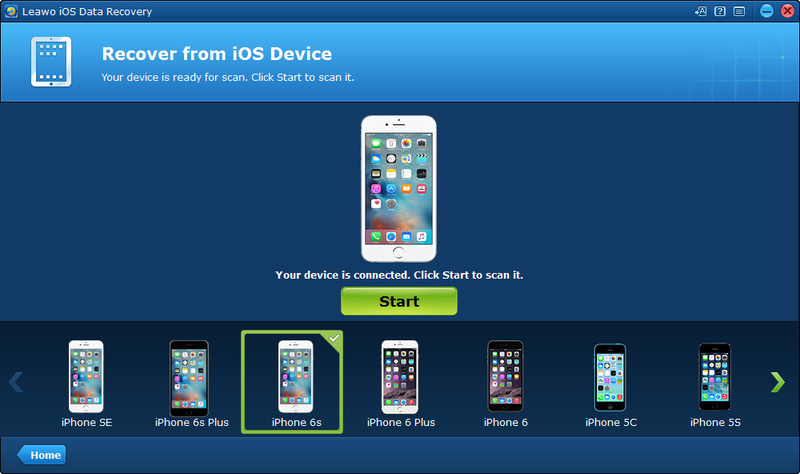 When popups bothers a lot of iPhone users, Apple didn’t just leave it like that. Instead, the company threw in an option called Block Pop-ups in Safari that’s supposed to help users block popups from websites. It might not be able to block all the popups as you’d think it can, but it does help prevent certain popups from interrupting you. So before you try any of the pop-up blocker apps out there, have this option enabled in Safari first. Here’s how to enable it in Settings. Usually this option is turned on by default, but in case it’s not on your iPhone, go check it out in Settings. 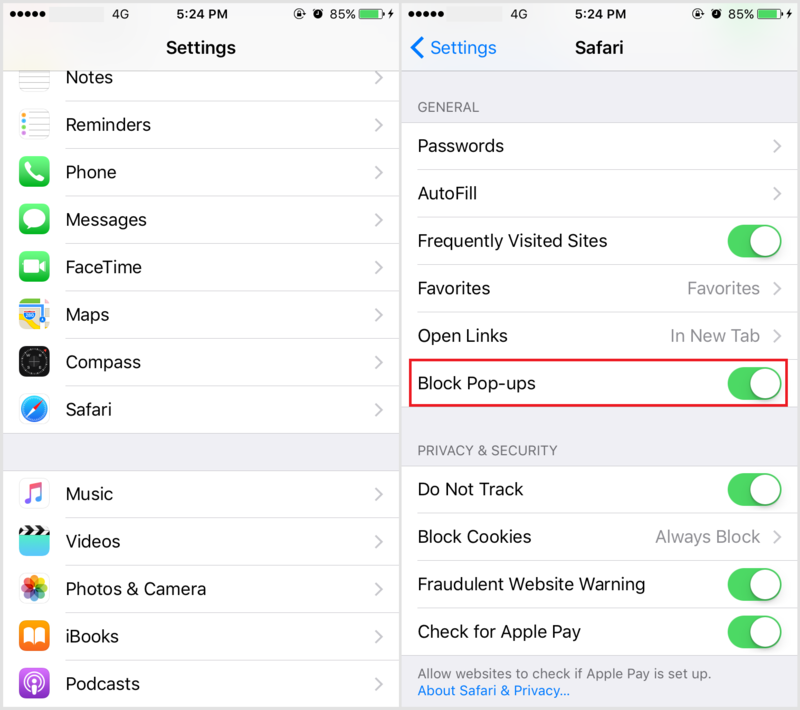 From the Home screen of your iPhone, navigate to Settings>Safari, scroll down, find Block Pop-ups and toggle it on if it hasn’t been activated. If you want all those popups and ads to bother you less, the options itself would not be sufficient. Try using an ad blocker app to help you block ads and popups. There are several safari extensions iOS users could use to block ads. 1Blocker is one of the best ad blocker iOS users could find. And Crystal is another adblock safari extension that works great in iOS. Both ad blocker app works as adblock safari extensions that run in the background. 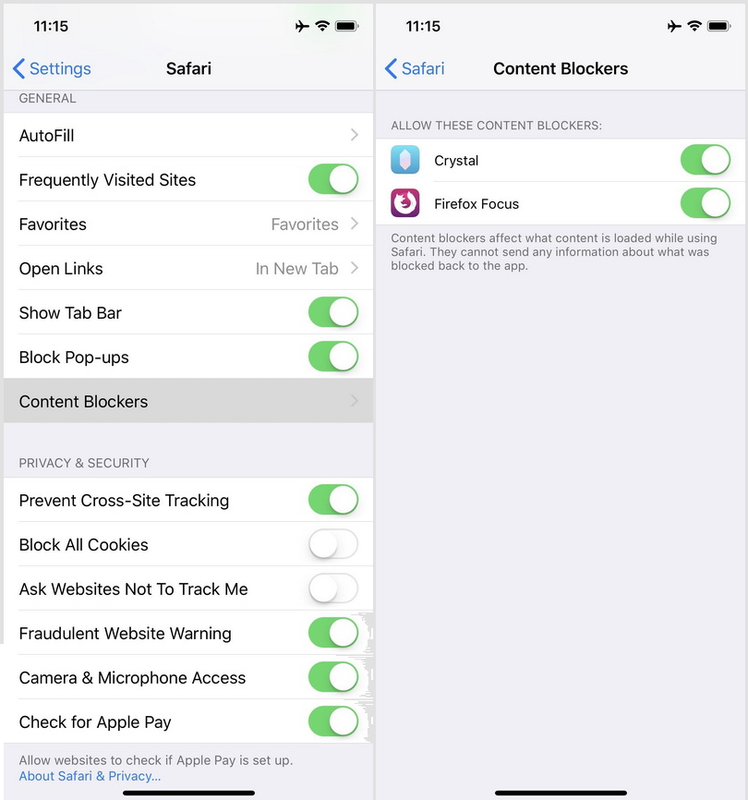 Another ad blocker app to block pop up ads on iPhone is Firefox Focus. It works as both an adblock Safari extension and a standalone web browser. If you are looking for the best ad block iOS device, I would suggest that you install all the 3 ad blocker apps. They are not free but also not expensive. $4.99 for the full version of 1Blocker and $0.99 for the complete package of Crystal is fairly reasonable. 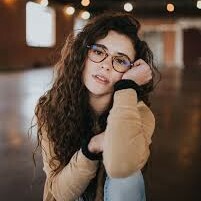 Just install them all onto your iPhone from the App Store, and then activate them in system settings and you will be able to enjoy a more pleasing web browsing experience. After installing those ad blocker apps onto your iPhone, here’s how to activate them in Settings. From the Home screen of your iPhone, go to Settings>Safari>Content Blockers and enable the pop-up blocker apps you’ve installed. When finding the best ad blocker iOS users could try the above mentioned apps. Install them on your iPhone and stop all those popups and ads from ruining your Internet surfing experience. There are other tips you may want to know, such as how to block spam text messages, how to block unknown calls. Click here to learn more: iPhone Safari Tips and Tricks You Need to Know. A lot of people would have plenty of different websites saved in their bookmark list in Safari. And many people have had the wrong bookmarks deleted when trying to organize their bookmarks. If you happen to have backed up your device to iCloud or iTunes, then you can still get the deleted bookmarks back. But if you haven’t have time to back up your iPhone, try using a third party iOS data recovery program to get back your deleted bookmark. 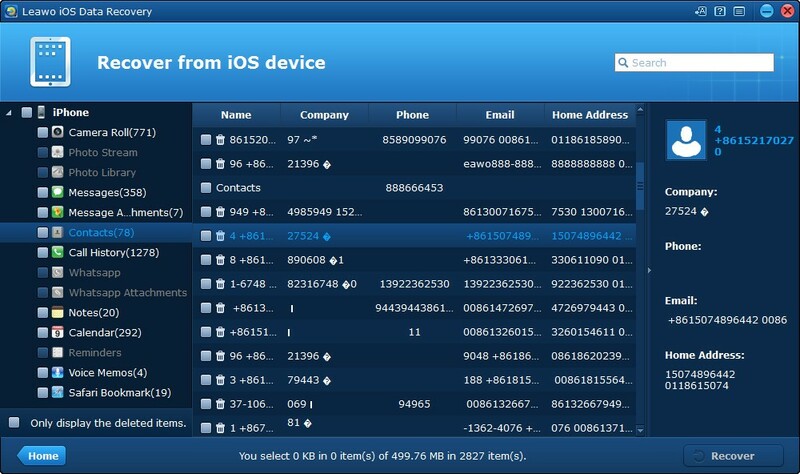 Here’s one program to do that: Leawo iOS Data Recovery: It can easily recover your deleted bookmarks from your iOS device without needing any backups. And bookmark is not the only kind of data it can recover. Other data that can be recovered with this program include photos, text messages, notes, contacts, call history, voice memos, calendar events, etc. 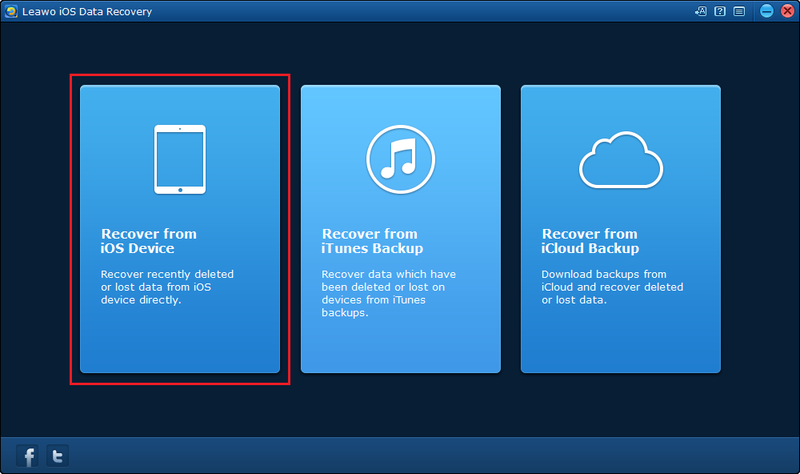 Check out the instructions below to see how to use it to recover your deleted Safari bookmarks. 1. First, use a USB cable to connect your device to your PC and then launch the program. 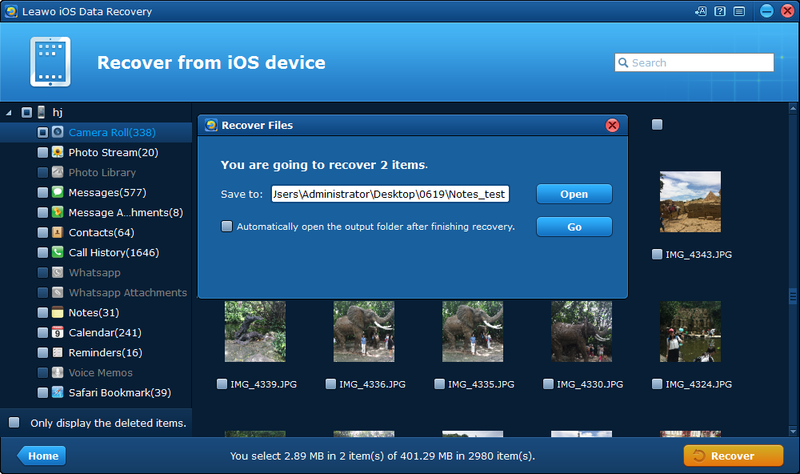 On the interface of it, click on Recover from iOS Device. 2. Click on the Start button that locates in the center of the interface so that the program can scan your device and look for the bookmarks you deleted. 3. After the program is done scanning your device, click on Safari bookmark at the bottom of the sidebar on the left and you will see all your bookmarks, including those you’ve deleted. Select those you want to recover and then click on the Recover button. 4. On the following window, click on the Open button and set the output directory for the bookmarks you are about to recover, and then click the Go button and the program will start the recovery process immediately. Ads and popups could be annoying when you are browsing the Internet, but with the right iOS ads remover, they could be less disturbing. Those ad blocker apps can’t completely block all the ads and popups, but they could significantly improve your web browsing experience.